Teenage activists turned politicians, multi-millionaire super tutors and artists fighting censorship – these are the stories of Generation HK. Teenage activists turned politicians, multi-millionaire super tutors and artists fighting censorship – these are the stories of Generation HK. From radically different backgrounds yet with a common legacy, having grown up in post-handover Hong Kong, these young people have little attachment to the era of British colonial rule or today’s China. Instead, they see themselves as Hong Kongers, an identity both reinforced and threatened by the rapid expansion of Beijing’s influence. Amid great political and social uncertainty, Generation HK is trying to build a brighter future. Theirs is a truly captivating coming-of-age story that reflects the bitter struggles beneath the gleaming facade of modern Hong Kong. 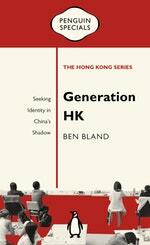 Love Generation HK: Seeking Identity in China’s Shadow: Penguin Specials? Subscribe to Read More to find out about similar books.